Explore two of Europe’s most beautiful island! Words seem inadequate to describe the actual divinity of Sardinia’s natural landscapes. Where dramatic rock-lined cliffs meet placid, emerald waters and other-worldly flora blankets mountainsides and river beds, Sardinia is one of few places in Europe that remains untouched and sheltered from time. Corsica is the Island of the beauty. Stunning pink cliffs drop sharply down to implausibly clear turquoise waters which elsewhere are fringed with sandy beaches. Inland, high granite peaks tower up in breath taking shapes while kites and buzzards circle the aromatic vegetation. Let’s discover all this on this exceptional tour! Morning Clients arrival in Cagliari airport, transfer to town for a visit. We will walk through the district of Castello and then we will reach the Juharia, the originally area where the Jews lived. We will visit the church of Santa Croce, built over the ancient synagogue of the city. Finally, we would go to the area that is improperly called the "Jewish ghetto", which was a military barracks. In fact, there was no ghetto in Cagliari. We will analyse the causes of the arrival of Jews in Sardinia. Afternoon We will move to visit Nora, one of the ancient towns near the coastline, where the first Jewish communities were organised. We will return to Cagliari to meet the Jewish cultural society “Chenàbura-Sardos pro Israele”. Tales from the Jewish community of Cagliari. Overnight: Hotel in the heart of Cagliari. Morning. This morning we move to visit Sant'Antioco. The catacombs in this little island in the south-west coast of Sardinia are very interesting. In fact, next to the Christian sepulchres, two Jewish catacombs have been discovered. We could see important funerary inscriptions in Hebrew and Latin. Afternoon We move to the small town of Calasetta to take the ferry to the little island of San Pietro to visit the colourful town of Carloforte, considered one of the most beautiful villages in Italy. Carloforte is a Ligurian linguistic island, because it was colonized in 1738 from the people of Tabarka, an island today linked with Tunisia. It will captivate you with narrow streets and alleys that climb up a slight slope, with colourful sea views, marina and ancient defensive fortifications, of which remain watch towers and stretches of walls with forts, including the Lion's Gate. Return to Cagliari for dinner and overnight. Morning Today we will explore the wonderful Sinis peninsula, a protected area with many archaeological and natural sites of great importance. We will go to the village of Cabras and to the museum of the Giants of Mont'e Prama. They are considered one of the most important archaeological discoveries of the 20th century in the Mediterranean area. They are huge stone statues dating back to the eighth century BC. Afternoon We will move to Tharros, a very interesting archaeological site that has a long history. It was a nuragic village, a Phoenician colony, a Carthaginian port, a city in Roman times, a town in the Byzantine age, and finally, the capital of the kingdom of Arborea in Medieval Era. On this site were found many Jewish artefacts. It was a seacoast town where the Jewish community held their trades. We will also visit the singular village of San Salvatore with its small church that hides a hypogeum temple dated to the fourth century. Dinner and overnight in Oristano area. 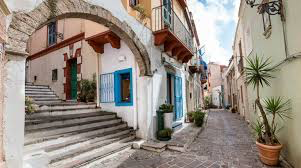 Morning This morning we will visit Fordongianus, known for the Roman baths, the church of San Lussorio and the seventeenth-century Aragonese house. What is less well known is that one of the major Jewish centres was in Fordongianus, an important Roman city before the mountainous areas of Barbagia. Right here, in the heart of Sardinia, David's descendants have practiced trades and businesses for centuries. A Jewish cemetery was discovered in the area of the church of San Pietro. Afternoon Free time. Dinner and overnight in Hotel. 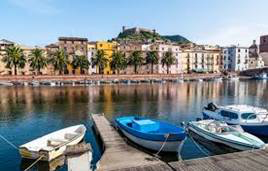 Morning Today we will visit Bosa, one of Italy's most picturesque village, characterized by multicolour houses along the mouth of the river Temo. His position near the sea, with the navigable river, saw the arrival of a Jewish community for commercial purposes. Jewish families probably lived in the district of the church of Santa Croce. Afternoon From Bosa we move to Alghero, called the little Barcelona. We will visit the ex Juharia and the Tower of the Jews. No systematic archaeological excavations have ever been made in the area, but over the years, the restoration of many buildings has brought to light much information about the Jewish community. Dinner and overnight in Alghero. Morning This morning we will Sassari and its historic centre. We will walk through the streets of St. Nicholas neighbourhood, the ancient Juharia, where Jews settled around 1345. The Jewish population of Sassari were mainly merchants and artisans. We will move to visit the archaeological site of Monte d'Accoddi, the only ziqqurat pyramid in Europe. Afternoon We arrive in Porto Torres, one of the major cities in northern Sardinia. In the area of the King Barbaro's palace were found 2 inscriptions written in Hebrew. Probably in the area there was an ancient Jewish cemetery. In the region of Porto Torres, a bronze ring with menorah was also found in 2010. We will come back to Alghero for dinner and overnight. Morning After breakfast we will move back to Cagliari airport and departure.